Free Easter Bunny Banner Printable - Of Faeries & Fauna Craft Co. The cottontail bunny bums are the cutest spring decor I have seen. You can find them in various banners, cookies, flower pots, cakes and so on. I love them all! This bunny banner is designed to be easy enough for children but can be used throughout the home for Spring or Easter. Hang it over a window, the corner of a picture, over a door, your mantel, or a backdrop for an Easter vignette. To create this printable I used the bunny template from Boys, Buildings, Books & Berries. I think it is the cutest bunny silhouette, showing a little bit of attitude with that bent ear. The colours are bright pastels. in the funnest modern patterns, I could find. To make your own Easter bunny banner, you will need a few very simple supplies. You will need the printed templates, scissors, pom poms, a hole punch, glue (optional) and string. The example I made uses only one of each printable, but of course, you can print all you need for a longer banner. 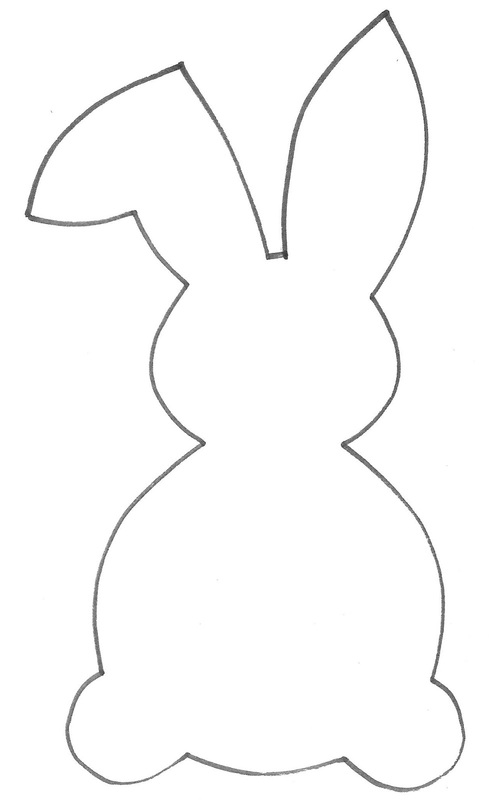 Start out by printing out the bunny templates onto card stock. Depending on the thickness of the card stock paper my printer can jam and refuse to print. If you need to get around this print the bunnies out on regular 8 by 11″ letter paper and glue to the cardstock before cutting. Once you have the templates printed, cut out with scissors. Using a hole punch, punch out a hole in each ear where the dots are on the printables. Personally, I adore the little multicoloured dollar store pom poms, but if you can use little balls of wool, or even cotton balls if you prefer. Simply glue them to the bunny template. Once the bunnies are finished simply thread them onto the string and hang. There are a total of six different bunny templates for you to choose from. They both print out on letter size paper. These little printables are so easy and inexpensive. I am printing out a few sets to give to my granddaughters and other little munchkins I know. Thank you for stopping by. Have a wonderful Spring! Hi Theresa: Print the templates out in black and white, place them on top of the paper you like and cut out the outlines. You could use paper clips to hold the paper in place if that makes it easier. Hi. Two Chicks and a Mom chose your adorable bunny banner to feature from the Celebrating Spring Link Party–hope you can stop by! Twochicksandamom/Donna recently posted…Celebrating Spring Link Party Features! These are just the cutest lil bunnies I ever did see!!! I love the patterns that you used!! So adorable!!! It’s a good thing my blog doesn’t date the days I reply because somehow I missed your comment Sam. My apologies. These little guys look hopeful and happy to me. Don’t you just adore the pastels in the springtime. This is such a sweet, cute little banner! Nothing says Easter and spring like bunny bums! Hi Megan: I totally agree, Bunnies are the cutest part of Easter decor. Every bunny I see is cute and adorable. Hooray for easy, inexpensive, beautiful Easter decor! Thanks for sharing! I am thankful about the pretty pastel colours and the hopes of flowers again. These little bunnies just seem so joyful to me. Happy Easter. These little bunnies are so adorable. What a fabulous project!! I’d love to have you link up at ‘Create, Bake, Grow & Gather’. Hi Kerryanne I will drop by. Right on Katie. If its for little ones they could do it as party activity. Thank you for letting me know. I saw your post over at A Little Bird Told Me’s Link Party. Rightfully featured as one of last weeks “Cute Easter Crafts”. I LOVE this project! So nice of you to include the printables! I can’t wait to print them out. Hope to see more of your cute crafts in the future! Thank you very much for stopping by. I am glad you like the bunny banner. That is amazing, thank you very very much Jennifer. This is great. I enjoy your party and will for sure drop by to see the feature. Woot Woot. This is the cutest banner! I’m interested in the digital scrap paper… is it called scrap? I have made digital paper purchases from etsy before if that is what it is. I love the patterns and colors but it is simply the cutest!!! Hi Debbie, its electronic scrap booking paper. This is the first project I have made for the blog with it and I love how it turned out. Instead of having to go purchase the paper with a template each set is identical regardless of how many you print. Thanks for commenting it makes me happy to receive comments. Thank you so much for the feature on Ambient Wares. It makes me really happy to have my posts shared and I am hoping lots of little munchkins will have these bunnies in their rooms, or on the windows. Thank you Michelle. They looked playful that way, instead of sweet. Glad you like them my artsy friend. Oh my gosh, too cute! I would love to make them too! Bunnies just say “hello Spring” to me. I have a serious soft spot for all the bunny bum decor I am seeing lately. I had to join in. Thanks for commenting Carolann. Always nice to hear from you. Leanna, these are adorable! Sweet bunnies! Happy Pink Saturday! Hi Gina: Thank you, aren’t bunnies one of those sweet characters that make us respond emotionally. Recently I have seen the bunny bum stuff and its just melts me lol. Thanks for the cute bunnies. For some reason I could only get the first three bunnies and second on would not open for me. Thanks. It looks fine from my computer, but I went ahead and redid it by separating out the links to the files. Please let me know if you have anymore issues and I will email the templates to you instead. Thank you Natasha. I was wanting to create something every little person would like and make either independently or with minimal guidance. I appreciate you taking the time to comment. Love the tail! So cute! Thank you Heidi. My little ones love glue and Pom Poms so Grama needed to make them that way. Hi Camille: Glad you like it. This is such an adorable spring-time project!! Would be perfect to hang for hosting Easter! Thanks so much for sharing :). Banners are such an easy fun inexpensive way to add fun to any seasonal decor. Thank you for commenting. Oh my gosh Leanna this is so adorable. I love the different patterns and their little fluffy tails. So so cute!! Thank you very much Toni. I think it brings a little bit of happy spring time. I hope you have a great week and thank you for commenting. As you know comments are wonderful. Hi Lindi: Pom poms sure seem to the spot with little girls. It rates right up there with glitter doesn’t it. This is the cutest banner, my girls would love this in their rooms, but so would I in my office!! Thank you for making this available Leanna!! Have a lovely day! Hi Katrina: Wonderful. For the office you could always just glue a little bit of ruffled office tissue paper as the tail. I hope you do have an office, I spent years in these stupid cubicles sometimes without a window. Ugh, it helped to personalize them with something cutesy. I hope your week is a good one. These are so cute Leanna. Simple, but perfect for Easter. Hi Cristina: Thank you. My grand daughters are my inspiration for these. I wanted to make something fun and easy their Mom or Dad could do with them. Thank you for the comment. The bunnies are adorable. I love the paper you choose to use and the floppy ear. Aren’t they just the cutest thing! Hi Debra: These are just printed out on plain paper, the pretty paper in included in the template. This is a new method for me and I am certainly going to do it again. Thank you for commenting and have a good week lady. Leanna, these are adorable! What a great way to decorate on a budget! Hi Melony: I really hope these see lots of use, children’s rooms, over mirrors, in classrooms and those awful office cubicles. This is the first time I combined a cutout with an computer paper. It was fun to do. OMG these bunnies are super cutee!! Love the idea, simple yet beautiful for Easter 🙂 Thank you so much for sharing this!! I’m just so in love with templates that I even started doing them myself! Hi Brenda: You make beautiful templates, maybe we can collaborate sometime. I think out tastes are very much alike. Thank you for reaching out and commenting. I appreciate it.